I have farmers but one generation removed from me in my bloodlines and my family has always had a garden. I never tasted a green bean that wasn’t fresh out of the garden or canned by my mother until I was in college (and boy did it taste weird….that’s a green bean?). The way I learned it, gardening is hard work. Period. 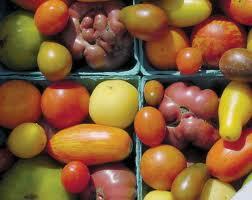 There’s weeding, there’s watering, there’s staking the tomatoes, there’s battling the raccoons for your corn. It is a never-ending battle of you against the forces of nature. Prepare to sweat. Fast forward to last summer. Our downtown Madison house is fine in many ways, but it is short on gardening space, and especially short on sunny gardening space. Last summer we got a plot in the community garden up on the hilltop, a 20 by 50 foot plot with ample space and sun. We bought many tomato plants (a number too large to reveal–to say I like tomatoes is something of an understatement), eggplants, peppers, squash, and sweet potatoes. We put them in the ground, watered them and then headed to North Carolina to take our daughter to horse camp for a week. While we were gone, it rained, and rained, and rained, and then it rained some more. When we came back, we could not find any of our tomatoes, eggplant, peppers, squash or sweet potatoes for the hip-high weeds that had sprung up in the week of rain. As my husband (who does not have farming in his bloodline) was bent over extracting these hip-high weeds, he turned to me and said, “Isn’t there an easier way to do this?” And at the time, I thought, no. And then my friend loaned me The Ruth Stout No-Work Garden Book. 1. Mulch. A lot. Like 10 inches deep. 2. When do you mulch, you ask? Now. Go and mulch now. It doesn’t matter what time of year it is, it is always a good time to mulch. Winter, summer, spring, fall. Mulching defies the seasons. 3. What should you mulch with? Whatever you have. Ruth uses spoiled hay, which is hay that is no longer suitable for feeding animals, and therefore well on its way to being decayed. You can also use clean hay, or straw, newspaper, kitchen scraps, leaves, grass trimmings. Get creative. 4. And then when do you plow? You don’t. You just mulch. 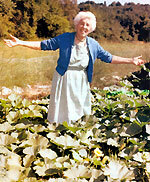 Ruth hadn’t plowed for 25 years and her garden was going strong. 5. What about weeds? Mulch them. If you see a weed coming up, throw some hay on it. It will die. Weeding done. 6. What about planting? Move the hay aside, put your seeds or plants in the ground, move it back in when your plants have reached a respectable height. Sometimes, you might not even need to move the hay aside at all. Ruth has from time to time planted potatoes by just dropping them in the hay. 7. What about water? Ruth has a shallow well, so there’s no watering her garden. With her mulching method, she doesn’t need to. 8. What about fertilizers? Ruth doesn’t use those either. 9. Why should I try this? Seriously? Did you read #1-8? No weeding? No watering? No plowing? No fertilizing? Go read #1-8 again. 10. Why does it work? Ruth’s not a scientist, and she sometimes has a bone to pick with the scientists, who do a lot of pretending to know why some things grow and some things don’t. Of course, many organic experts will tell you to mulch. None probably as enthusiastically or extensively as Ruth. The hay decays and enriches the soil with time is the simplest answer. The other day I was out in the woods, and we went off trail. I found myself tramping along through….leaves. Dry leaves. Layers and layers of dry leaves. What might Ruth call dry leaves? Ah, yes. Mulch. Mulch seems to work for nature, so I feel this is the simplest answer to this question. 11. Does it work? Well, you can check back in August, because I’m a convert and I’ll be trying this out myself. My friend mulches her garden heavily according to Ruth’s rules and feeds a family of five out of her veggie garden. There are still raccoons to contend with, and bugs sometimes. But no more or less than in a non-mulched garden. And again, read #1-8. Translation: Let’s all admit that we have no real idea why plants thrive sometimes, and fail others. Gardening is a crap shoot and anyone who tells you differently is lying. Translation: Learn to let go. There’s also a great passage where she describes a pamphlet put out by the National Plant Institute which equates witchcraft and organic gardening. 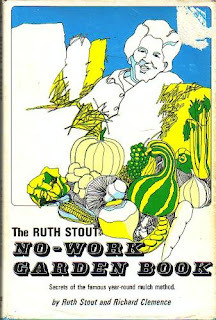 You can get the basics of Ruth’s mulching method in about 20 pages of this book. The rest is just for fun. What’s your approach to gardening? Is there mulching involved? Have you ever tried Ruth Stout’s method? Farmers. There have to be farmers around there. I think I follow a blog from a farming family up your way.